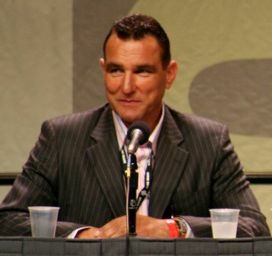 Vincent Peter "Vinnie" Jones (born 5 January 1965) is a British actor and former professional footballer who played as a midfielder from 1984 to 1999 notably for Wimbledon, Leeds United, Sheffield United and Chelsea. Born in Watford, Hertfordshire, England, Jones represented and captained the Welsh national football team, having qualified via a Welsh grandparent. As a member of the "Crazy Gang", he won the 1988 FA Cup Final with Wimbledon, a club for which he played well over 200 games during two spells between 1986 and 1998. He also played for Chelsea, Leeds United, Sheffield United and Queens Park Rangers. Jones was a defensive midfielder who was especially noted for his very aggressive style of play, earning him a "hard man" image on the field. Read more on Wikipedia.